VetShout! delivers fully customizable e-newsletters to your client database. 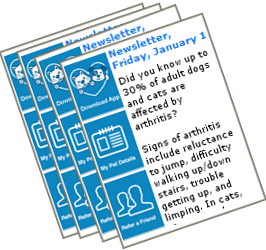 These Newsletters are a cost effective and efficient method of communication for your entire clinic. Emails can be personalized using the client's first name and pet's name. Select the articles that best serve your clinic from our extensive database and then select the dates you'd like the newsletters delivered, it's that simple! Newsletters are a fantastic way for you to keep in front of your clients by introducing new products or services, share health news & tips, inform clients about new clinic information, offers and promotions etc. Copyright © 2012 VetShout, Inc.